I am currently in the process of trying to build a solid state laser that is pumped by a charge of flash powder. Usually, people just use flashlamps to pump ruby and such, but if I can get a flash powder setup working, it would be cheap and scalable for LARGE chunks of laser glass and other media. Obviously my biggest obstacle is in the timescales. I need my powder to fully combust on a timescale comparable to the fluorescence decay lifetime of the lasing energy level of my lasing medium in order to achieve a population inversion. Flash powder is NOT an explosive, so sticking a fuse in the charge definitely is not going to cut it. My idea is to run a thin wire down the length of the charge, and then vaporize it with a very short pulse from a capacitor bank. Will it work? Who knows...but I'm willing to try. So on to the question. In a flashlamp capacitor bank circuit, a HV pulse is used to ionize the gas in the tube to make it conduct, allowing the capacitors to always be hooked up to the lamp. I obviously cannot do this in my flash powder setup, and if use a switch I'll likely just blow up the contacts instead of quickly setting off my charge. I really don't care if I burn through switches quickly, I just want to make sure the majority of my capacitor energy goes into my flash powder. What kind of circuit do I need to build to achieve this? I'd really appreciate any help! A row of spark plugs the length of your charge won't work? Multiple flame kernels the length of your charge. I mean the idea of a cap bank it to use that energy to pump your crystal, yes DUH I know, but if the FP is your pump then automotive spark coils and iridium spark plugs is all you need, the cap bank is kind of a waste isn't it ? Here's a solenoid with contacts someone built. Also industrial switching gear is spring loaded to make it snap shut to avoid an arc. A residential switch box has the spring loaded snap shut deal. D Square brand comes to mind, also these commercial units are made to snap shut and not bounce back apart. I wonder if you used magnesium wire, like used for flash bulbs in the past, if the whole length of the wire would flash fast enough ignite the flash powder all at once? This wire would not take much current at all but due to length, probably vaporizes relatively slow compared to what you need, unless you build in lots of small elements all around the core to reduce the time and flash them all in parallel. This is akin to using spark plugs, but with this wire, you could have a lot more of them spaced much closer together, it would be a fine cob web though, a pain to build. I've read some about military experiments with one use chemical lasers, but I don't think they are flashed through this method, if I remember correctly, they were using explosives with magnets and wires, pushing the magnets through a coil at an incredible speed to induce the current they needed to flash them somehow, but I don't remember much about the documentary, that was years ago. LOL, now I'm thinking about FP recipes, I know styro is a chemist, but how do you get more bright and less bang, and isn't brighter also slower by nature as far as light produced, I know finer powder burns faster but I wondering about if there's a way to get more light and less gas pressure. I wonder is the wavelength of the light produced by the chemical reaction would make a difference for pumping the crystal? Another fun video for us thread readers, I'm sure styro already has a special mix. I would think of using a same cap supply for a flash tube. A few hundred V and forget about contacts, use a beefy SCR to control the current and dump everything into the wire when triggered. I did that before using a thin wire to light up firecrackers from a photoflash cap charged to 300V. Everything powered by a single AA. Thanks for the input everybody!! Your replies helped a bunch. I just picked up a bunch of old cameras from the thrift shop for some caps/triggers, so now I can start experimenting. Ah yes that is exactly what I need. Obviously it defeats the purpose of using flash powder if I already have a massive cap bank, but I'm hoping that this setup will be able to get my powder to go up quickly. This is the part of the project that I've put the most time into so far. The spectrum of the emitted light from the flash powder is extremely important in pumping the laser. Even if a source of light outputs a lot of energy quickly, it will not work if the wavelength of light emitted doesn't fall on one of the pump absorption bands of the laser medium. This brings up an issue, as the quicker the flash powder burns, the hotter the flame will become, shifting the emission towards UV (assuming the flash is acting as a blackbody radiator). The UV light will not only waste a considerable amount of the flash energy, but it can do serious damage to my lasing medium. luckily I can always filter out the UV emission with regular glass, and just use more powder to compensate for the energy loss. the original, and my tests show it is pretty violent. Comments: Heat of reaction: 8.989 kJ/g, Gas volume: 15 cm3/g, ignition temperature: 700°C, impact sensitivity test: 26% of TNT. half a pound of this flash delivers 120 million candlepowder. It is used in the M120A1 and M112A1 flare cartdriges. Energetic stuff, but unfortunately quite toxic. I have dreamed up the disposable laser cartridge before, with mass robotic production tolerances we could have a shell with a lens in front that vaporizes just after the light pulse exits, but I was thinking that chemical lasers were a super light producing chemical reaction, like supercharged glow stick juice or something. But as I'm sure you know the chemical lasers were chemical rocket motors that produced a very toxic gaseous byproduct from their burning that was also a very efficient gain medium that produced huge power levels but had to be made and used then vented on the spot, not at all what I imagined when I first heard of it. Very interesting stuff and who knows what is yet to be discovered. I read about a Russian method for producing an incredible energy pulse, they would use a high speed flywheel with magnets surrounded by coils to produce energy and then high speed explosives to force it to release an intense burst of power, it was a one shot deal as the flywheel was destroyed each time, but the energy pulse was more power that it takes to run a city for an instant. If that could be miniaturized to jolt a super gain medium like our chemical laser gas in a directional manner and be carried on the front of a tank you could possibly vaporize everything in front of the tank like a energy shotgun burst. Now build that into expendable cartridges and you have a super weapon, knowing the Russians it will produce an EMP to wipe out a city. Actually that was done in oceans 11, they called it a "pinch" , no doubt it's on the menu of developmental weapons. @styropyro Do you really think there is enough energy produced to accomplish what you want. I mean you are trying to create photic energy chemically which by its very nature is going to produce heat and gas as essentially waste in this process...not very efficient...different yes. As you get more brissant though you will wind up with something more explosive which will kind of put an end to the experiment. I didn't know about the flywheel, just that a US version of a explosively driven power source by shooting magnets down and through coils to produce a lot of power. I was remembering this was to somehow power a laser, but that doesn't make much sense right now, might have been something else like what you are writing about. EMP is the way to destroy an enemy today, at least, a technological one and the weapon of choice to be used against us someday in the USA, I fear. Regarding Syro's desire for a fast high current switch, I don't see the need for a high current one if you use magnesium wire, if thin enough it will immediately vaporize to set off flash powder without much current. I think you're confusing power with energy. 50 megawatts might sound like a lot, but if the pulse duration is 5 femtoseconds for example, I'd happily stick my face in it. I understand what you are talking about, joules or a measure of energy over a period of time, just like the human body can take a lot more G's for a very short duration, however impact such as swinging a bat concentrates energy over time into a short pulse that will break things, so it depends on how it's applied and just how much total energy we are dealing with. 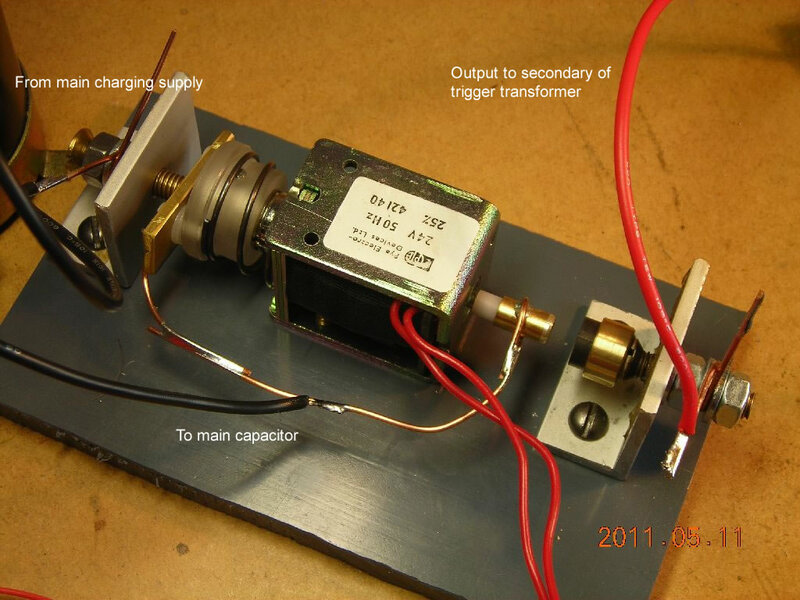 An explosive-driven ferromagnetic generator is a compact pulsed power generator, a device used for generation of short high-voltage high-current pulse by releasing energy stored in a permanent magnet. It is suited for delivering high-current pulses to low-impedance loads. The FMGs consist of a permanent magnet, a high explosive charge, and a pickup coil. They are a kind of phase transition generators, utilizing pressure-induced magnetic phase transition effect. By adjusting the number of turns of the coil, which can be as low as a single turn, the generator can be designed for delivery of high-current low-voltage pulses or, with more turns, low-current high-voltage pulses. The shock wave generated by explosion destroys the magnetic domains in the magnet, cause loss of the magnetic field, and the very sudden change induces a high-peak electric current in the surrounding coil. Both the shock wave directions parallel to the vector of magnetization and perpendicular are possible to be used. One of the possible configurations is a ring magnet with the explosive charge in its center. Some high energy Directed Energy Weapons (DEW) R&D examples for lasers, microwaves, and EMP. I was looking for some laser components and stumbled onto this. I found many blog sites with people asking where to buy or how to make 'home-use' EMP generators to 'remedy' noisy neighbors' stereo equipment. Fortunately, the majority of responses cited laws already on the books for their responsible use in addition to just plain 'DBAA' (just learned that term on Breaking Bad). Yea that just heats the first layers of skin, not designed to be damaging. This we talked about in the register your drone thread too. Did you know maser was used before laser? That's actually where laser started from. Man sure has developed an ability and an appetite to create some nasty stuff. Hope we don't ever (need to?) see it used.